Showing 49 articles from April 12, 2017. RALEIGH -- Palziv North America, an internationally recognized manufacturer of polyethylene foams, will add 40 jobs in an expansion to its operations in Louisburg, Governor Roy Cooper announced this week. 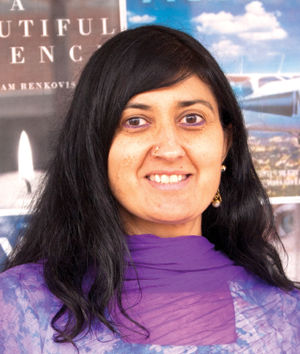 The company plans to invest nearly $5.2 million in Franklin County. "North Carolina enjoys a reputation on the global stage as a great location for manufacturers," Governor Cooper said. "Companies have many choices when they evaluate a location, and this decision proves North Carolina offers everything a manufacturer needs to succeed." LOUISBURG -- It's official -- the Franklin County Board of Education is preparing to request an additional $1.1 million in current expense money from the county commissioners next year -- and plan to dig deeply into their fund balance to make that budget work as well as to help pay for many needed repairs. The school board met Monday night and made that request official following a in a budget-only session held last month to tweak the numbers before the budget request was formally adopted. 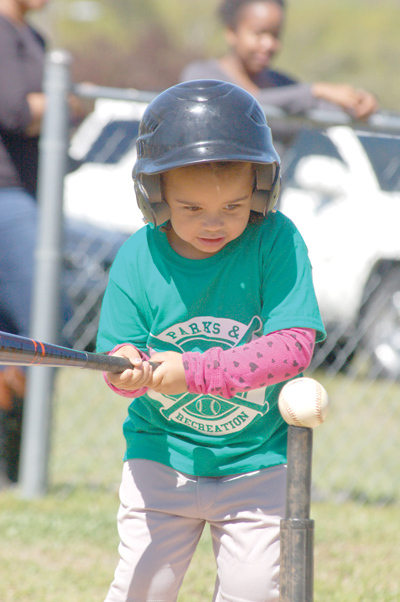 Tatyanna Perry focuses on the ball during Opening Day for Franklinton Parks and Rec. Hundreds of players and families celebrated the second year of the re-established program on Saturday. For more information about the program, visit www. 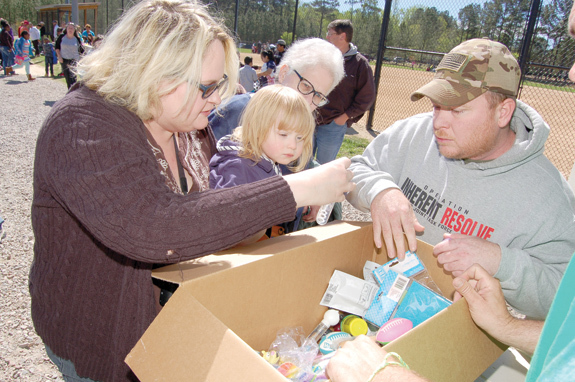 http://www.franklintonnc.us/departments/parks_and_recreation.php, or call (919) 494-2520. Water, water: Why is there no water? LOUISBURG -- Protectors of the county's water supply applied the brakes to three new subdivision developments, giving engineers and staff time to polish off a plan that will guide allocation of the county's limited resource. Last August, an engineering company performed a water/sewer allocation study for Franklin County, concluding that the county "should remain diligent and aware of the limitation of remaining water and sewer capacities when considering the additions of any large volume customers and subdivisions..."
YOUNGSVILLE -- The Greater Franklin County Chamber of Commerce is slated to host a reception for Sen. Richard Burr at 6 p.m. Tuesday, April 18, at Cross + Main, 201 East Main Street. Burr, elected to the U.S. House of Representatives in 1994, and, served five terms, is serving his second term in the Senate. The reception is being held in partnership with the Granville, Henderson - Vance, Rolesville, Wake Forest and Warren County chambers. FRANKLINTON -- Authorities arrested a Maryland man, alleging that he sexually exploited a 14-year-old Franklinton girl and threatened her and her family. 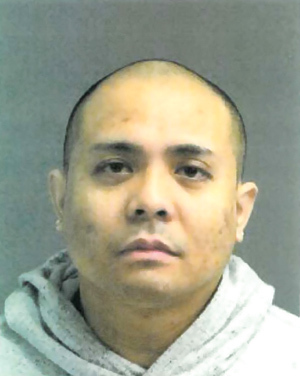 Franklinton police, with the aid of the State Bureau of Investigation, the Maryland State Police Internet crimes Against Children Task Force, Homeland Security and the Anne Arundel County Police Department arrested Piere Ceradoy, charging him with sexual exploitation of a minor. He was taken into custody at his Crofton, Md., home without incident. 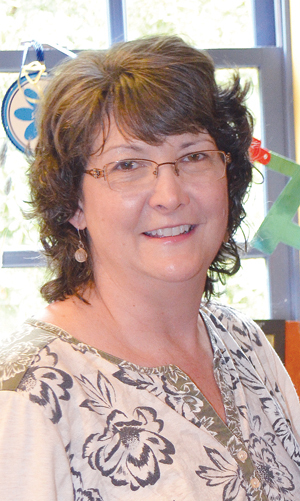 LOUISBURG -- When Patricia Burnette Chastain was first appointed as the county's Clerk of Superior Court nearly four years ago, she set a goal of making sure her office's financial accounting was top notch. Last month, the North Carolina Administrative Office of the Courts Financial Services Division recognized Chastain and her staff for achieving an effective rating; the highest-possible overall internal audit opinion. Pretty light display has a frightening side, too! It's really cool ... or, downright scary. Actually, it's a bit of each and for good reason. Talking about Particle Falls, a dazzling display of science, art and light that was unveiled in downtown Raleigh last month and featured in our March 30 edition. It's the work of a group of environmental leaders, including Novozymes, and is an animated light projection that was shown on the side of a four-story building just a block away from the State Capitol. When I was growing up, I had plenty of friends. If I wanted to play a game of hide-and-seek (Google it youngsters), there was always a good number of friends from the neighborhood that I could round up for a worthy hunt. If I was looking to round out a basketball squad or field a football team, there was always a bunch of friends to choose from -- (You know how it works; the best and fastest are chosen first). Why do NC schools pay sales tax, await rebates? My work through the Ben Franklin Society with the Franklin County Early College High School (ECHS), has convinced me of the dire need for basic student instructional materials - that's computers and books! What a super day at Frazier Field on the Louisburg College Campus that Blake Herring, head baseball coach at LC, and co-planners, including former LC head baseball coach Billy Godwin, planned and executed for LC on Saturday, April 1, for Baseball Alumni. LOUISBURG - Funeral services for Barbara Waters, 64, who died Monday, April 10, 2017, will be held Tuesday, April 18, at 2 p.m. at St. Paul Presbyterian Church in Louisburg, with the Rev. Felicia Hardy officiating. Burial will follow in the Haywood Church cemetery. ENGLEWOOD, N.J.- Funeral services for Dion Lionell Alston, 39, who died Saturday, April 8, 2017, will be held Saturday, April 15, at 1 p.m. in the Richardson Funeral Home Chapel in Louisburg, with the Rev. Anthony Alston officiating. Burial will follow in the Perry's Missionary Church cemetery. LOUISBURG--Funeral services for Laddie Mae Vines, 73, who died Tuesday, April 11, 2017, will be held Saturday, April 15, at 4 p.m. in the Richardson Funeral Home Chapel in Louisburg. Burial will follow in the Vines family cemetery. Bunn High School's Delaney Wilson (right) takes a lead off first base during last Friday afternoon's Northern Carolina Conference home doubleheader sweep against the Franklinton Lady Rams. 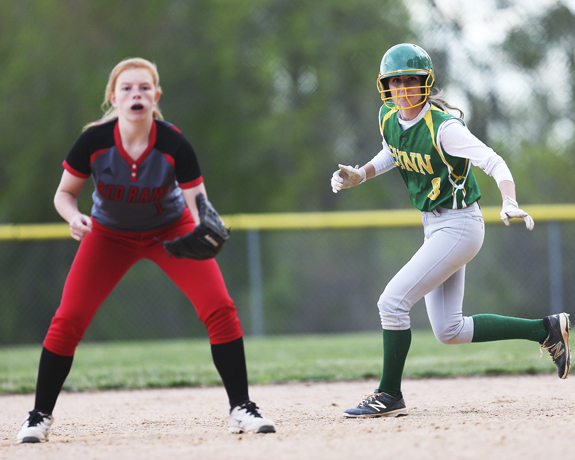 BUNN -- Some people might be a bit surprised by Bunn's impressive softball record this spring, especially considering the fact that the Ladycats would be competing without long-time standouts and college signees Erica Davis, Charlotte Murphy and Stephanie Williams. But BHS veteran head coach Melanie Lovin had a feeling her club would be a contender in the always-strong Northern Carolina Carolina, thanks in part to the return of several veteran leaders. A HERO'S WELCOME. 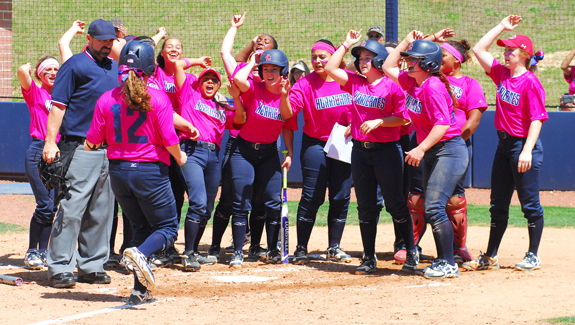 Louisburg College's Marieva Daniels (12) is greeted at home plate after delivering a towering home run during Sunday's home softball doubleheader against rival Spartanburg Methodist College. 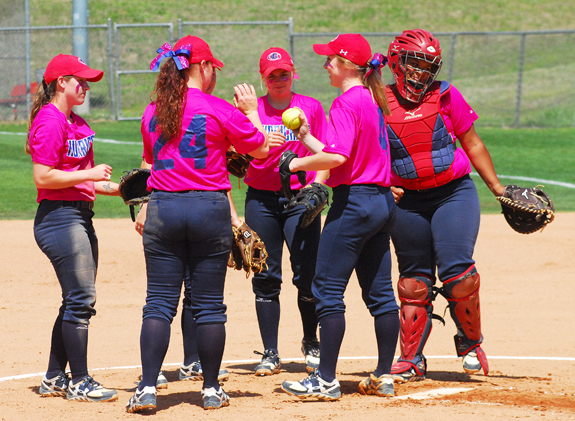 LOUISBURG -- Louisburg College might boast a gaudy 30-5 overall record on the softball field, but it hasn't come easily. The Lady Hurricanes have played several close games, but that intangible suits head coach Michelle Carlson just fine as her club prepares for next weekend's Region X Tournament. BACK TO THE BAG. Louisburg College's Seth Johnson (right) avoids a pickoff throw during Sunday afternoon's home diamond doubleheader against the University of South Carolina-Sumter. 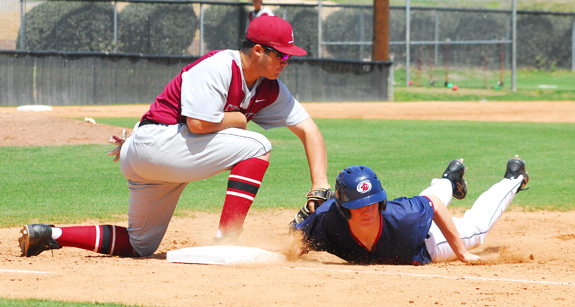 LOUSBURG -- Unlike past seasons, there is a nice reward nugget waiting for Region X baseball clubs that are able to earn a Top-Four finish in the league's always-tight regular season diamond standings. The conference has a new format for the annual Region X Tournament, with the Top-Two regular season finishers earning first-round byes. 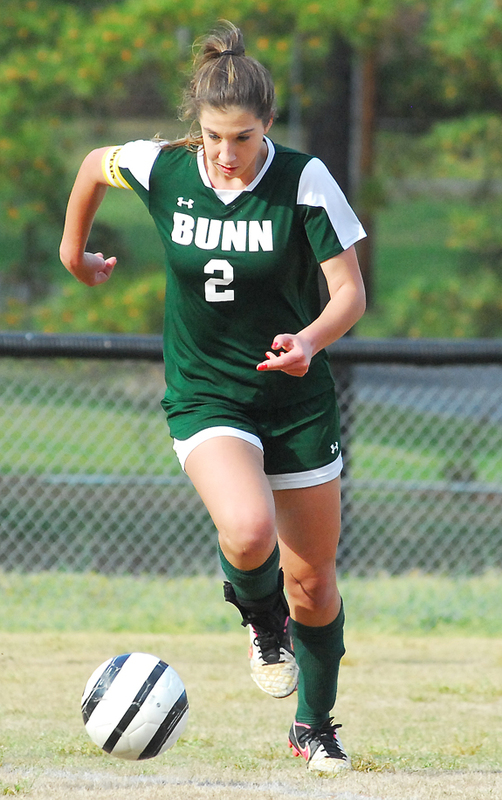 BUNN -- Bunn High School's girls soccer team continues to make an upward trend as the 2017 campaign progresses toward its final stages. Bunn picked up a pair of key wins recently, including an impressive 10-3 decision last Thursday on the road against the Southern Vance Lady Runnin' Raiders in Henderson. Alex Husinko continued her goal splurge by delivering four tallies to spark the Ladycats' 10-goal uprising. WILMINGTON, DEL. -- Marcos Diplan and Freddy Peralta carried a no-hitter into the eighth and closer Nate Griep pitched around a lead-off triple in the ninth with three straight strikeouts as the Carolina Mudcats defeated the Blue Rocks 2-1 at Daniel S. Frawley Stadium on Monday night in a Class A Carolina League baseball matchup. The Mudcats (3-1) managed just one hit in the road victory, but scored twice and held the Blue Rocks (1-3) to only one run and four hits for the game. BUNN -- The First Annual Bunn High School Football Golf Tournament is slated for April 21 at The River Golf and Country Club. Cost is $200 per four-person team or $50 per individual. 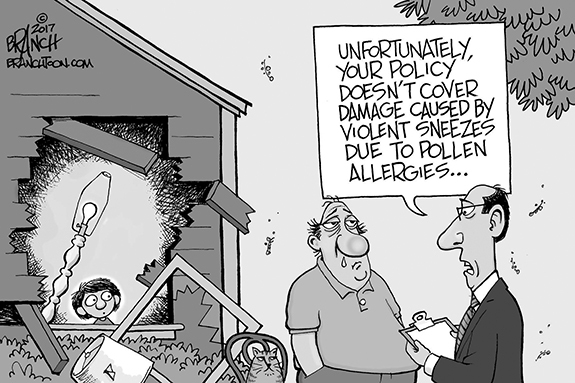 Mulligan packages will also be available. A four-person superball format will be utilized. 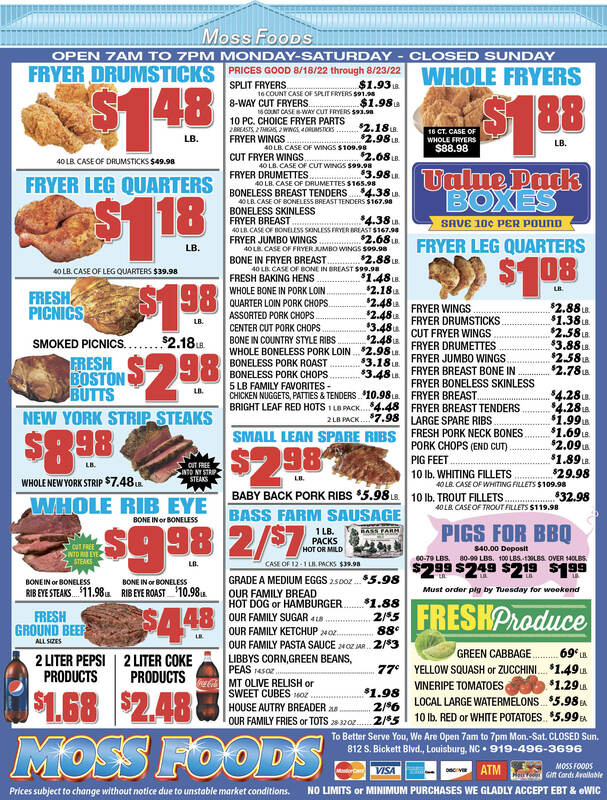 Tournament cost includes green fee, cart, water, drinks, snacks and a barbecue chicken dinner. ALMOST THERE. 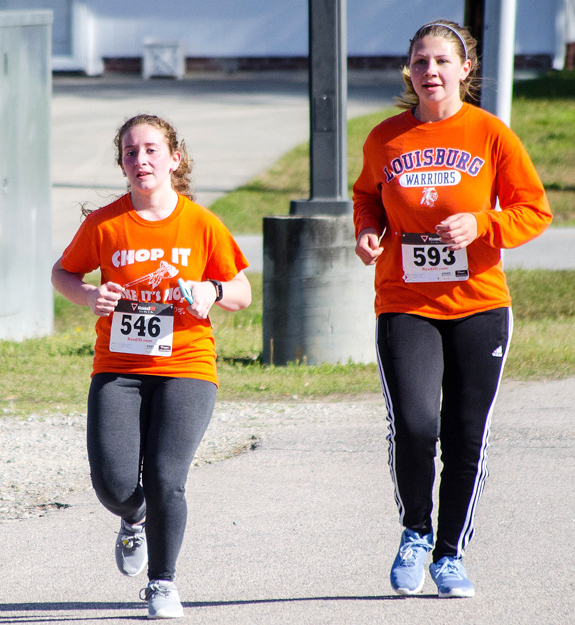 (L to R) Nicole Craig and Haley Ayscue take part in the Warrior Pride 5-K Scholarship Run. LOUISBURG -- Enjoying a good workout, having fun and helping with a good cause. What could be a better way to spend a Saturday morning? That was the sentiment last Saturday as the Third Annual Warrior Pride 5-K Scholarship Run was held at Louisburg High School. LOUSBURG -- Louisburg College cross country coach Jay Koloseus is excited to announce a strong recruiting class for the 2017-2018 school year. The Canes look to build on to their current national powerhouse squad with 13 early commits. On the women's team, Southeast Raleigh's top runner Eboni Roberson has signed to represent Louisburg. She is accompanied by Joia Hervey and Kayla Hately from powerhouse Southview High. Joined by the pride of local Rolesville High School, Kalya McAgy, the upside of this early distance class is tremendous. 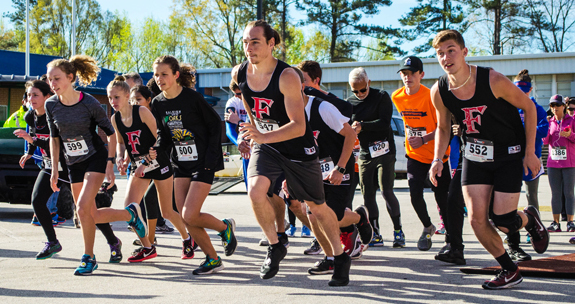 Runners, including several from Franklinton High School, take off to begin the Warrior 5-K Scholarship Run, which was held last Saturday morning on the LHS campus. 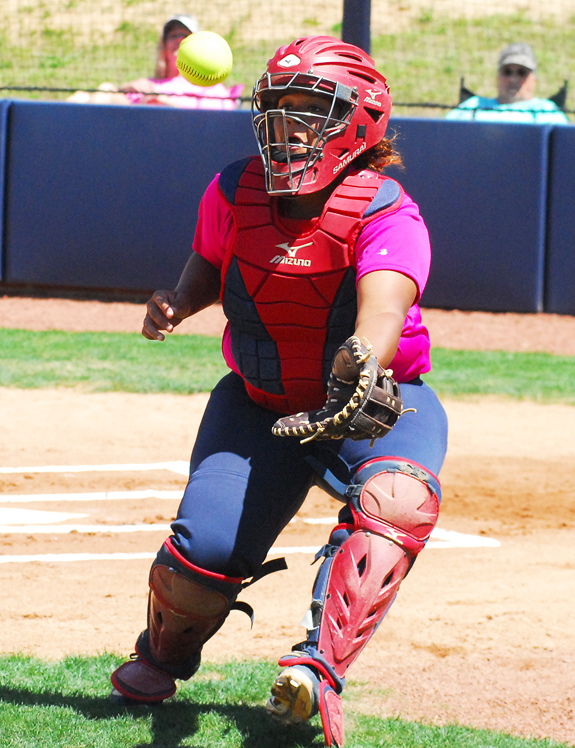 Louisburg College backstop Kortney Thomas reels in a foul ball during Sunday's home doubleheader. 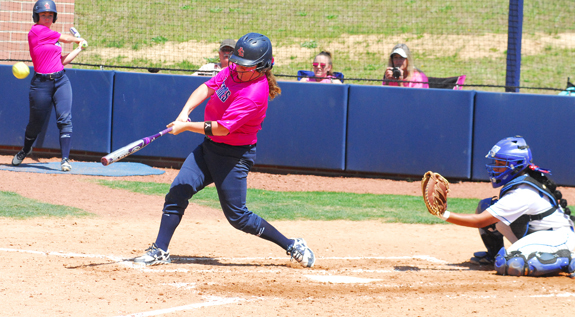 This home run from Marieva Daniels was one of the highlights of Louisburg College's home weekend softball sweep against rival Spartanburg Methodist College. Members of the Louisburg College softball team meet in the circle before the start of an inning as part of Sunday's home doubleheader sweep versus Spartanburg Methodist. 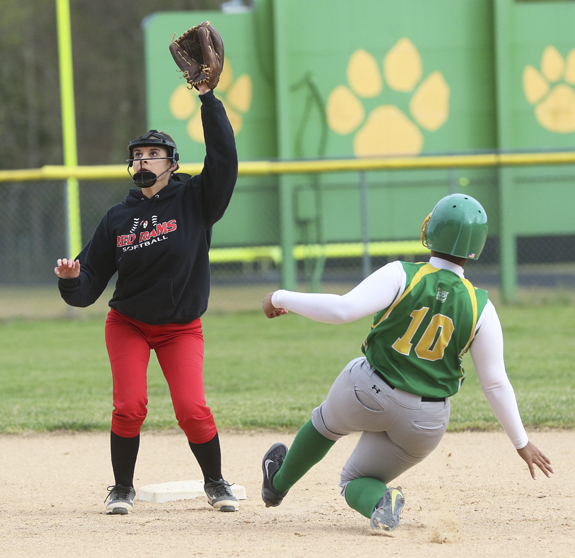 Bunn High School's Kamesha Rogers (right) makes her way to second base as Franklinton's Halyley Poole awaits the throw during last Friday's softball doubleheader at BHS. 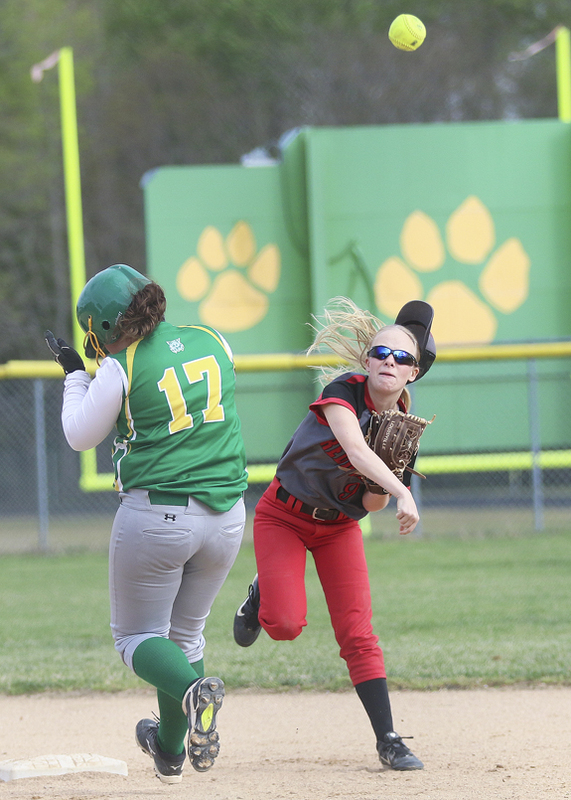 Franklinton second baseman Kelsey Forsythe (right) makes a relay throw as Bunn's Alli Davis tries to avoid the ball during last Friday's Northern Carolina Conference softball twinbill. 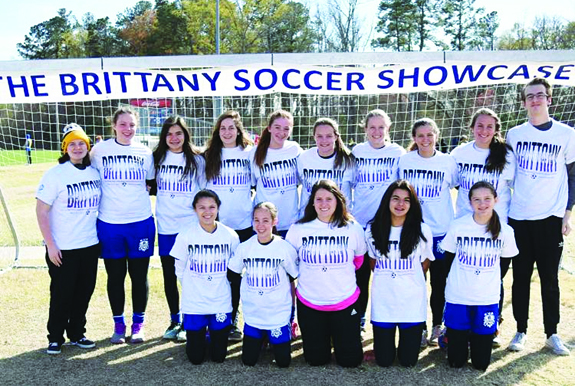 The Kerr-Vance Academy girls soccer team recently participated in The Brittany Girls Soccer Showcase at Gillette Park in Wilson. Meagan O'Leary was saluted as K-VA's Sportsmanship Award Winner and received a commemorative ball. 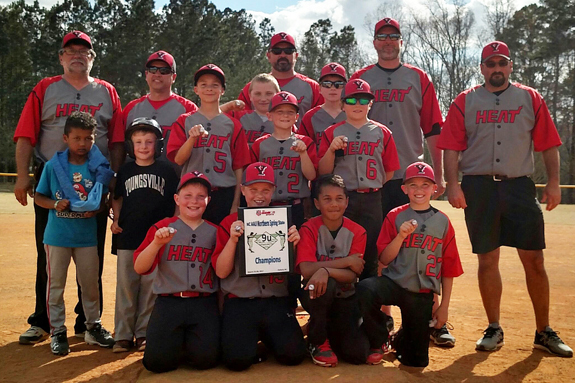 The Youngsville Heat Travel Baseball Team recently secured three shutouts on its way to winning the North Carolina AAU Northern Spring State Championship 9-Under Tournament, which was held in Oxford. In the title game, the Heat delivered a 12-0 victory over the North Wake Tsunami. 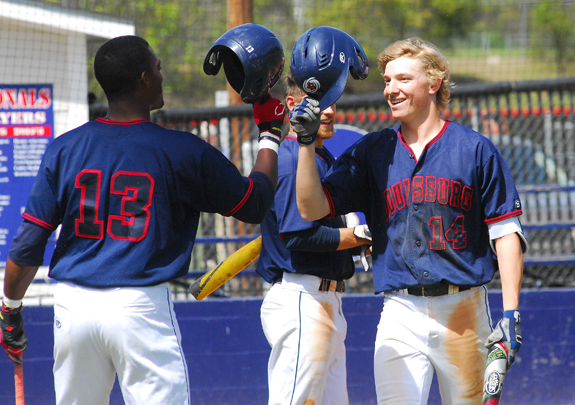 Louisburg College's Seth Johnson (right) is welcomed back to home plate after hitting a home run during Sunday's home diamond twinbill against the University of South Carolina-Sumter. Chelsea Flaxcomb and Chris Griffin announce the birth of their daughter, Elizabeth Ann Griffin, born April 1, 2017 at Maria Parham Hospital in Henderson. She weighed 8 pounds, 11 ounces and was 20 inches long. The Vance-Granville Community Band will hold its annual spring concert at 7:30 p.m. Monday, May 1, at McGregor Hall Performing Arts Center in downtown Henderson. Admission is free. This will be the second time that the Community Band has held a concert at the 1,000-seat venue, located at 201 Breckenridge Street in Henderson. Louisburg College's spring musical, Little Shop of Horrors, will be presented in the Norris Theatre on the campus of the college beginning Friday, April 14, and continuing through Sunday afternoon, April 23. The show is presented by special arrangement with Music Theatre International, in New York, and funding for the production has been provided by local supporters. Franklin County's Third Annual Film Festival, sponsored by Franklin County Arts Council and Franklin County North Carolina International Film Festival (NCISAFF), will be held Saturday, April 22, from 10:30 a.m. until 5 p.m.
A red carpet photo session at 10:30 a.m. will kick the day off at Franklin County Arts Council's headquarters at 22 S. Main Street in Franklinton. An exciting lineup of 13 films from around the world are on the program to be screened throughout the day; a closing award ceremony will begin at 4:30 p.m.
EGGS-CITEMENT. 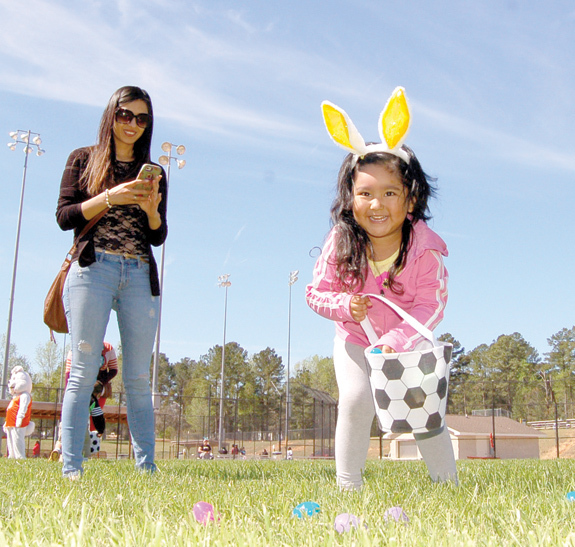 Catalina Rebollar grabs some eggs while her mom snaps a picture. EGGS-CITEMENT. 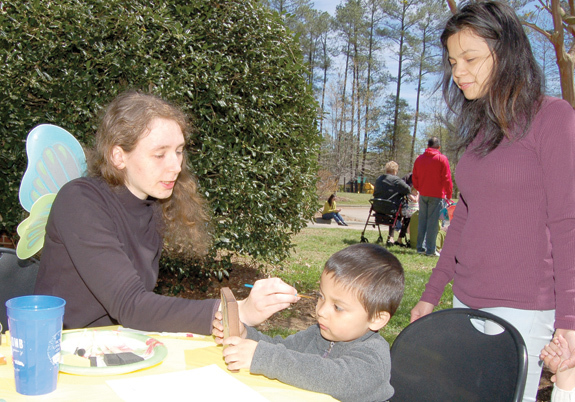 Jillian Brickley paints Malachi Christian's face while his mom, Mary Joy, looks on. LOUISBURG -- As school officials prepare for the 2017-18 school year, the Franklin County Board of Education named David Averette principal of Franklinton Middle School at its regular meeting on Monday evening. 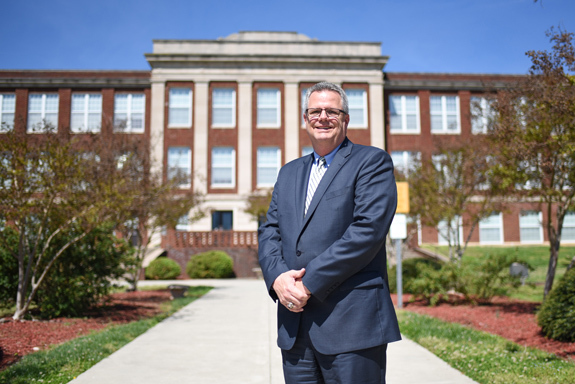 Averette, who has served as assistant principal of Franklinton High School since 2007, says he's excited for the opportunity to build on the growth that Franklinton Middle School has seen in the last few years. 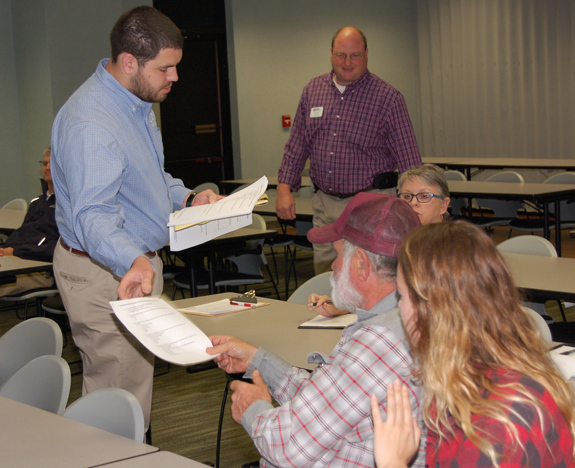 YOUNGSVILLE -- A group tasked with figuring out whether a new farmers market will fly in Franklin County met with residents during its second public meeting on the matter. The Franklin County Cooperative Extension has tasked staff with Lois B. Britt Agribusiness Center at the University of Mount Olive to perform a feasibility study to see if a new market is something the county can sustain. LOUISBURG -- The county's airport authority agreed that it would recognize a guiding force behind the birth of the county's airport. Billy Lumpkin, who passed away in February, was chair of the Franklin County Airport Study Committee, where his efforts were key in securing the federal funds and the site needed to build the airport -- which is now Triangle North Executive Airport. Patrick Polumchek, center, and members of Franklinton High School's theater program performed a number from "Footloose" last Saturday during the school's Cow Pie Bingo Festival, a fundraiser for art programs. The group will have a three-day run of the show beginning on May 18 at the school. LOUISBURG -- Police are looking for a suspect in a shooting on Tuesday evening that sent a Louisburg woman to the hospital. According to Police Chief Rick Lassiter, there was an apparent dispute between two men in the 500 block of Kenmore Avenue just after 7 p.m. when one of the men standing in a yard began to fire shots toward the car. LOUISBURG -- A Franklin County man was sentenced to more than 24 years in jail on sexual assault charges. Franklin County sheriff's deputies arrested Omahd R. Coppedge in October 2013, after the mother of a then 13-year-old girl alleges that the 36-year-old raped the teenager on Dec. 31, 2012. Apparently, the crime came to light earlier in 2013 when parents became aware that the girl was pregnant. LAKE ROYALE -- An international group dedicated to helping people in their communities, including here in Franklin County, is celebrating 100 years of service this year. Civitan International, headquartered in Birmingham, Ala., celebrates a century of service in 2017. It is an organization of volunteer service clubs with more than 40,000 members in North America, Europe, Africa, and Asia. 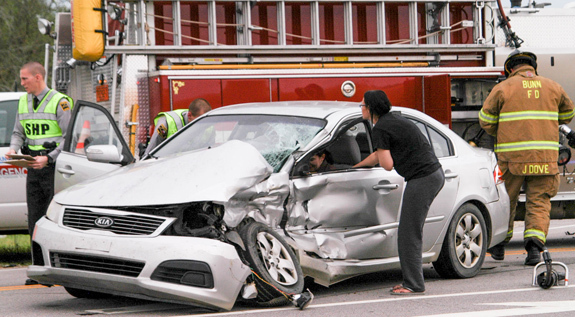 LOUISBURG -- A school bus driver and a motorist were transported to the hospital April 5 following a wreck along one of the county's main thoroughfares. According to the State Highway Patrol, Sharon Fuller had just left Royal Elementary School on Flat Rock Church Road with a load of students when she approached the intersection of U.S. 401 just before 3 p.m.
PD Shades, located in Five Points Commons, 100 Holden Road, Suite H, Youngsville, recently held its grand opening. PD Shades was started by a brother/sister duo: The "P" stands for Precious and the "D" stands for DJ. The locally raised duo always wanted to start a business and the concept of PD Shades was inspired by their love of sunglasses, fashion, and a desire to find an innovative way to share their mother's story. Their mother, Sabrina, suffers from a rare kidney disease and PD Shades supports #Kidney4Sabrina, with 20 percent of proceeds going to her foundation.